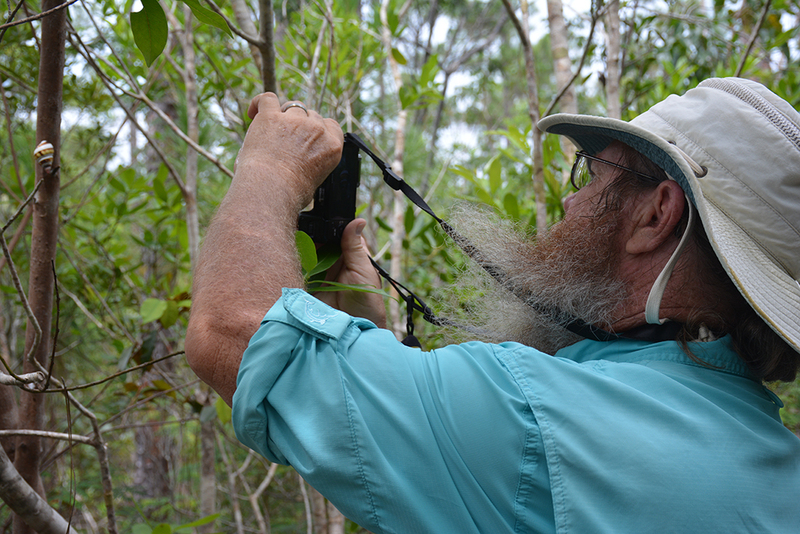 Pinelands Ecotone | Florida Hikes! Unnamed, un-blazed, and wild, following an old jeep road, the Pinelands Ecotone is an extraordinary hike along the ecotone between two rare habitats – pine rocklands and sawgrass prairies. 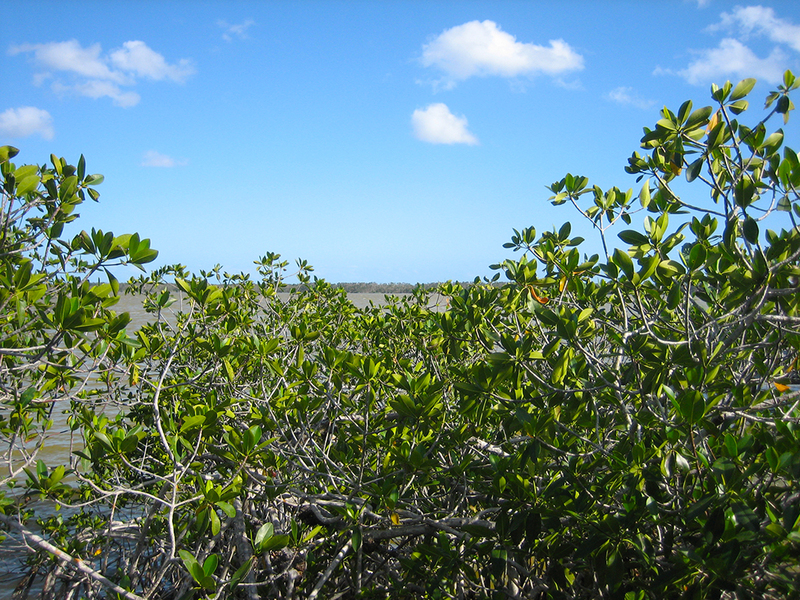 It immerses you in one of the most intriguing parts of the Everglades: its rocky, pitted karst. Created by the steady erosion of the limestone bedrock, the barren karst is a jagged landscape of rough pinnacles, natural bridges, and solution holes. The trail is rough and rugged – not recommended for young children – because of the loose limestone underfoot. Wear long pants and a long shirt on this trail: the sharp stems of sawgrass intrude into the footpath, and clusters of poisonwood grow under the slash pines. 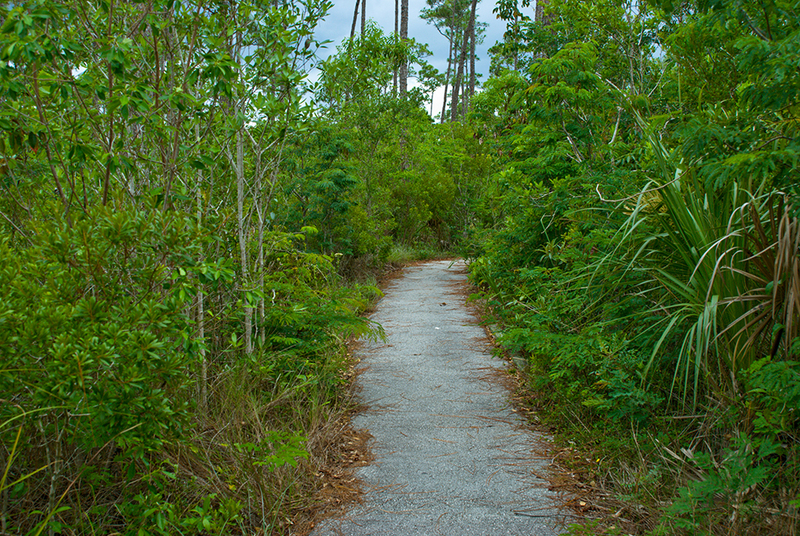 To find the trail, shown as the northernmost trail on the “Pineland Trails” map handed out at the visitor centers, drive along the Main Park Road south from Royal Palm Hammock. As you pass the Long Pine Key campground (2.3 miles south of the Royal Palm Hammock turnoff), keep alert on the right for gate G11, sitting slightly down from the shoulder of the road. The gate is 0.8 miles north of the Pine Lands parking area north entrance. Start your hike at the north end (gate G11) as the south end (gate G9) is more likely to get your boots wet, even in the dry season. With two cars, you can park at each gates and make this a 3.8-mile one-way hike. But with only one car, you’ll need to use the park road as a connector. Leave your car at the Pine Lands nature trail parking area and start your hike by walking north for 0.8 mile along the left shoulder of the Main Park Road to access gate G11. Keep alert for the turnoff on the left; the gate is just a little ways in from where the jeep trail leaves the park road. As you walk into the pine rocklands, notice the skimpy slash pines rising against the blue sky. Hurricane Andrew trashed this forest more than a decade ago, but the wizened little trees fought back and reclaimed a foothold. 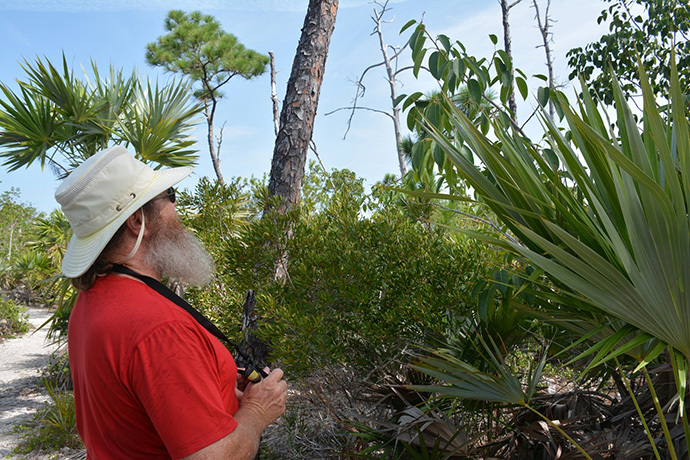 Now Florida’s rarest natural community, extensive pine rocklands only exist here on Long Pine Key and on Big Pine Key in the Florida Keys. As the trail curves left, it weaves between small clumps of forest amid the plain of jagged rock, where winged sumac sports crimson fall colors, and wax myrtle crowds the understory of each tiny hammock. Off to your right, a vast vista of the sawgrass prairie opens up as the forest on the left becomes a tangled wall of tamarind and poisonwood. Buttonwoods and poisonwoods crowd closely as the trail curves to the left around 1.6 miles. The footpath becomes even rockier underfoot. You’re in the heart of the pine rocklands karst, surrounded by rough and jagged openings to solution holes below. As you walk past a broad solution hole on the left, filled with water, it looks like a garden full of succulents. Plants thrive around these almost-permanent water sources, which trap receding floodwaters and cache the limited rainfall of the dry season. As you cross an open stretch of sawgrass prairie, you can see how the mats of periphyton plaster grass to the rocks during the dry season. At 2 miles, pause for a look at an extremely craggy solution hole on the right, filled with the fantastical forms of pinnacles and bridges in miniature. Another solution hole has duck potato growing in clusters from its watery base. 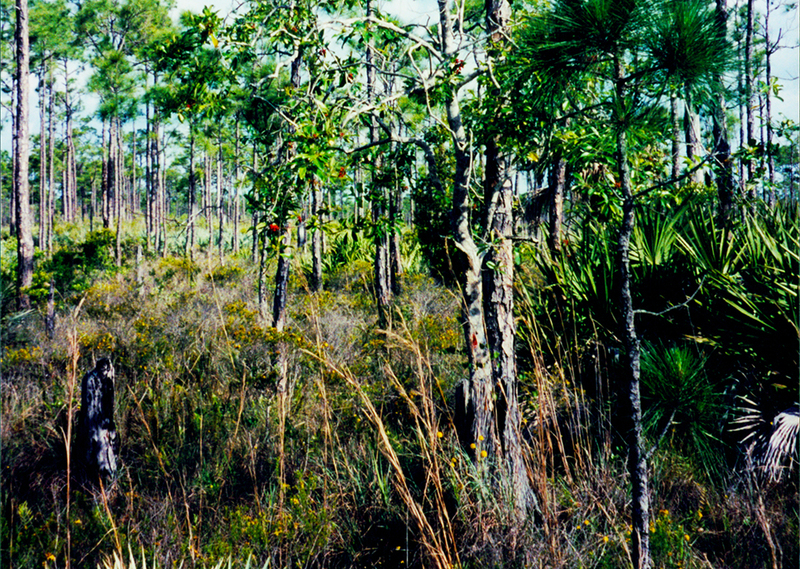 Continuing through the pine rocklands, the trail is now entirely surrounded by craggy karst hiding under the sawgrass. As you walk along the edge of a tropical hammock, surrounded by deep pits and grooves of solution holes, notice how the surface is so craggy that it looks like broken lava flows, the dried periphyton atop it mimicking a layer of ash. 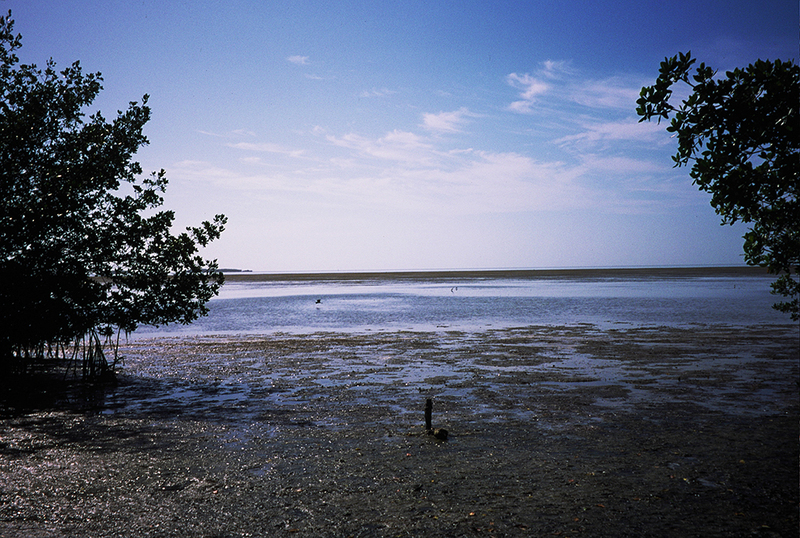 When you reach the open mud flat at 2.3 miles, keep to the left side to follow the trail. Numerous bathtub-sized solution holes filled with aquatic plants ring the trail. The trail curves left, rising up out of the rough karst into slightly higher ground topped by slash pines. You notice more scattered solution holes, but they are now more obvious as distinct geologic formations rather than dimples in a broken landscape. Emerging along the sawgrass prairie, you walk the ecotone, where the pine rocklands meet this vast sheet of marl topped by the river of grass. At 2.9 miles, the trail passes through a small hammock before returning to the edge of the prairie along the bare karst pinnacles. As the trail gets wet underfoot, watch your footing. When the periphyton gets damp, it’s as slippery as black ice. The trail curves sharply left away from the prairie and heads back into the pine rocklands, passing through a heavy thicket of poisonwood and hog plum. Keep alert as to where you put your feet. There’s the first of several small solution holes in the trail at 3.2 miles, just the right size for a misplaced step. Agaves grow beneath the poisonwoods. 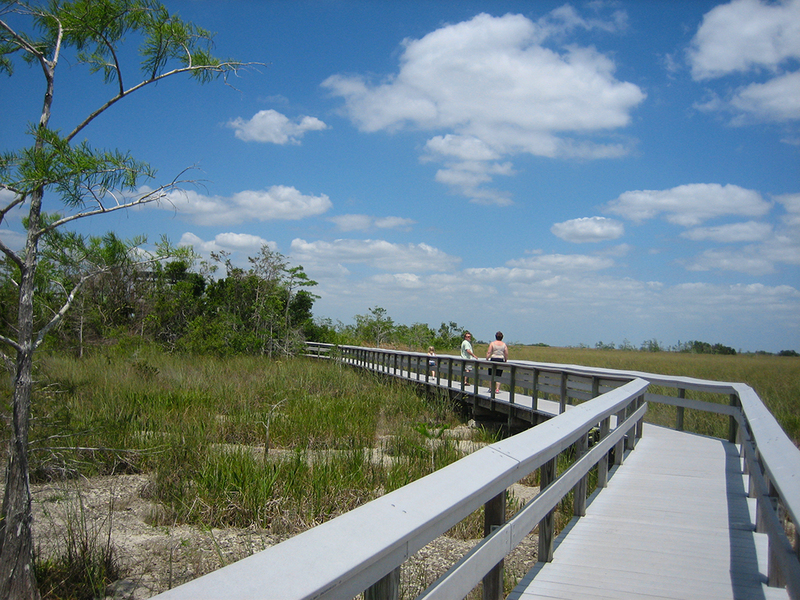 As the trail comes back out to the edge of the sawgrass, you pass a large water-filled solution hole at 3.3 miles, dense with aquatic vegetation. You walk past a playground of karst surrounding a pond apple: rocks on top of rocks, some ash gray like lava flows, others shot through with holes. On the left, broad solution holes form small marshes. As the trail veers away from the prairie at 4 miles, water seeps into the periphyton on the footpath, creating a slippery mud that when crushed underfoot looks like swirls of turquoise paint: the mucous-like tendrils of blue-green algae that make up the majority of the periphyton mats. Returning to the prairie’s edge, the trail continues behind hammocks of buttonwood that shield your clear views of the river of grass. Passing another craggy garden, you see a broad depression out in the prairie, crowded with willows. Vegetation crowds close in at 4.3 miles as you drop down off a small hummock, walking through a low spot where the hydrated periphyton glows a bright greenish brown. Taking one last curve away from prairie, the trail ends at gate G9. Walk around the gate and out to the entrance road. You’ve hiked 4.6 miles. To complete the full loop, turn left to carefully walk up the shoulder of the Main Park Road back to Pine Lands, completing your hike after 5.9 miles.